All Saint's choir, Raheny is one of a small number of Parish Churches on the Northside of Dublin to have a Robed Choir. The choir, in its early days was composed of Men & Boys. The Boys came from Baymount School, which closed in 1946. The School, which was sold to the Jesuit Order, and is now a House of Retreat, known as Manresa, had been associated with the neighbourhood for over 40 years, and for over a quarter of a century, successive sets of pupils had formed part of the Sunday morning Choir. The robes at that time were purple. The present Choir consists of Men & Ladies and continues the well established tradition of rendering sacred music to a very high standard, and the dignified appearance of the members in their Royal Blue robes does much to add to the solemnity of the services. Over the years, the Choir has taken part in the Fingal Choral Union Services, which brought Choirs together from C of I Churches in north county Dublin; Dublin Corporation Choir competition in St Patrick's Cathedral; Parish Concerts and performed sacred music, independently, and combined with other Church Choirs, such as, J Staines "The Crucifixion" and J Maunder,s "Olive to Calvary" Choral Evensong is still sung at the "Patronal Service" on All Saints day. Although, now small in number the Choir still manages to sing in four parts S.A.TB. 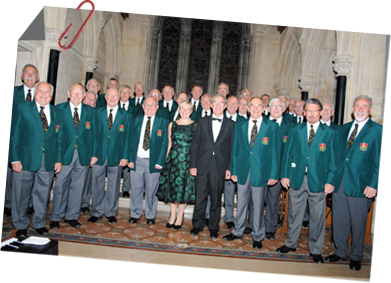 At a Harvest Concert in Sept 2012, the Choir provided support items to the Carton R.F.C. Male Voice Choir from Cardiff, Wales, by singing music from G & S "The Mikado". Click below to subscribe to our bimonthly parish newsletter via email.